From David Osborne, the author of Reinventing Government--a biting analysis of the failure of America's public schools and a comprehensive plan for revitalizing American education. 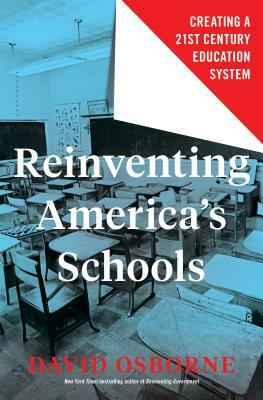 In Reinventing America's Schools, David Osborne, one of the world's foremost experts on public sector reform, offers a comprehensive analysis of the charter school movements and presents a theory that will do for American schools what his New York Times bestseller Reinventing Government did for public governance in 1992. In 2005, when Hurricane Katrina devastated New Orleans, the city got an unexpected opportunity to recreate their school system from scratch. The state's Recovery School District (RSD), created to turn around failing schools, gradually transformed all of its New Orleans schools into charter schools, and the results are shaking the very foundations of American education. Test scores, school performance scores, graduation and dropout rates, ACT scores, college-going rates, and independent studies all tell the same story: the city's RSD schools have tripled their effectiveness in eight years. Now other cities are following suit, with state governments reinventing failing schools in Newark, Camden, Memphis, Denver, Indianapolis, Cleveland, and Oakland. In this book, Osborne uses compelling stories from cities like New Orleans and lays out the history and possible future of public education. Ultimately, he uses his extensive research to argue that in today's world, we should treat every public school like a charter school and grant them autonomy, accountability, diversity of school designs, and parental choice. David Osborne is the author or co-author of five nonfiction books: Laboratories of Democracy; Reinventing Government, a New York Times bestseller; Banishing Bureaucracy; The Reinventor's Fieldbook; and The Price of Government. He has written for the Atlantic, the New York Times Magazine, Harper's, and many other publications. Osborne is currently a senior fellow at the Progressive Policy Institute, directing the Reinventing America's Schools Project. He lives in Gloucester, Massachusetts.